During the recent Demo Day I was able to show my work to a number of people. I created a Missing Person poster for the main character, Maria Rivera, which was hung above a chest of 18 small drawers. People seemed engaged with the set of drawers I had on display and they spent time opening them and trying to understand the objects inside. For this demo I was interested in what story the objects inside the drawers told people. Most people seemed to understand that the story was about a missing woman who was a water dowser. They liked the multimedia element of having an iPod playing just one opera song on repeat. A few of them opened all the drawers and even looked up the URL on their phones I had listed on a piece of paper to the Main character, Maria’s blog. Figures 2 and 3 are the list of clues that I originally envisioned for the project. For the demo I had about half of the clues in the drawers. My professor urged me to find a way to orient the users as they engage with the project. I have to find a way to clue them in to how they are meant to engage with the instillation and what their role is within the story. Playing through these “room escape” games, both physical and digital, are giving me the tools to create engaging puzzles for my thesis. I created a timeline for the last day that Maria was seen: How was this evidence put together? Who knew when she woke up? Who knew that she went on a hike? Etc. 8am: She goes to the St. John’s River Trail - She loses her necklace or pendulum. 10am: She appears at work at the Crystal Barn. 1pm: She orders lunch over the phone from Watsons Veggie Garden and picks it up. 6pm: She goes back to the St. John’s River to look for her lost item. 6 - ? : She disappears. When was she reported missing? Who reported it? I decided to create three game mechanics or puzzles to control the release of information about the story. They are listed below. I also have a chest of 18 small drawers. These drawers will be filled with clues and story flavor elements. One of the drawers will trigger the playing of a Rusalka opera song, as well as trigger a light that will illuminate an object (maybe my Rusalka Headdress). I am designing with a few constraints. Unlike an escape from the room game, a gallery instillation has the user's attention for about 10-15 minutes max. 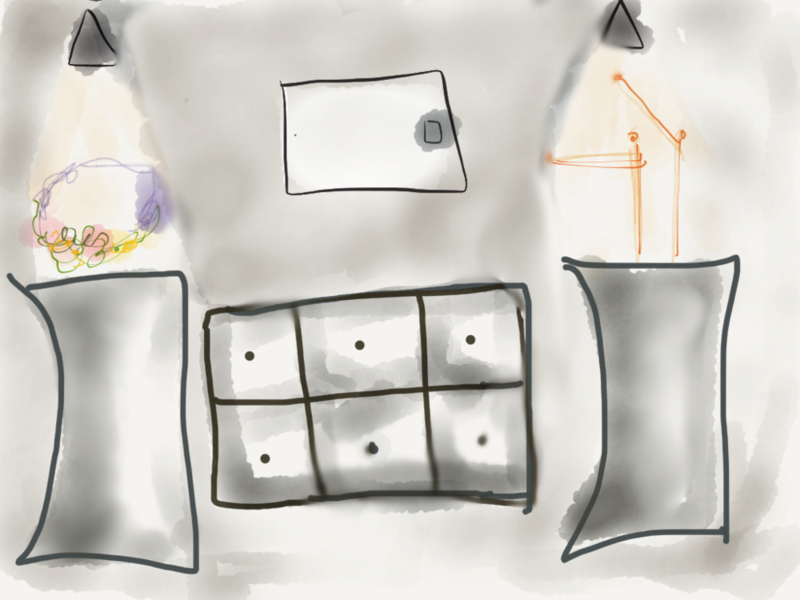 Moreover, there may be one to three people in the instillation at a time, so that means that the user should have multiple points of entry into the story and puzzles. I have four points of entry into the story: map, books, drawers, and board of clues. The map color codes those below. The final solution to the mystery of Maria's disappearance lies inside the book safe. However, the user should be able to put together the clues throughout the instillation to start to piece together the story weather or not they open the safe. Remake the User Experience and Information Release map. Make a list of artifacts and items that is numbered and connect it to map. User Test the User Experience of the puzzles.